Brief Description: A British soldier injured in an uprising in India finds a beautiful red stone pendant, but he soon becomes alarmed by its mysterious powers and sells it on. This sets the pendant on a journey through many unscrupulous hands, leaving devastation in its wake. Orphaned girl, Maud, thought she would spend the rest of her days in the workhouse, but happiness comes in the form of a position in service for a grand house. Little does she know that a far greater destiny awaits her. What is Maud’s special relationship with the pendant? How will it lead her to discover important truths about her parentage? And when the pendant is parted from her again, will it ever find another heart as true as hers? About the Author: Sheila Woods grew up in the East End of London and has worked most of her life in health care. She is now retired and loves angling, writing and painting. Happily married, she now lives in a village in Cambridgeshire. I found this short novel a pleasant and well written story. From one Sheila to another - congratulations and keep on writing! A mysterious red pendant with apparent supernatural powers, seeks out pure souls and burns any wrong doers possesing it. From the British Raj, through Victorian England, World War One, and beyond, the pendant and Maud's life are intertwined in this well told little tale. Well done Sheila. Keep writing! What a very nice story. It reads as if it were a true account of a real happening. It’s time scale from the early 1890s to the 1950-60s fitted in well with the story. Well done Sheila. 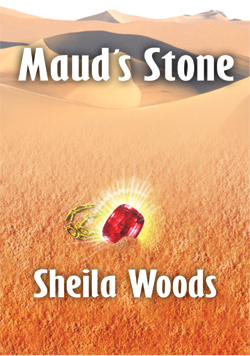 MAUD’S STONE is only fifty pages in length, but don’t let that put you off. Good things often come in little bundles. A mysterious red pendant, a British soldier in India during the Raj, an orphan girl called Maud and the intriguing Mrs. Montague. What more could you want? MAUD’S STONE would have delighted Charles Dickens, I’m sure. Follow the pendant on its travels, but – more importantly – discover how it leads Maud herself to the most profound discoveries about her family heritage. A unique tale told well. With a Cockney flair to the storytelling, author Sheila Woods rushes the story of Maud’s Stone along with the captivating lilt of Eliza Doolittle, through dialogue. Many English soldiers and officers died during the Indian rebellion of 1857. Corporal Reggie Simmons had been left for dead on the battle field—a stone dug into his hip as he rolled over in agony—an exquisite red stone lost by an Indian Prince. Reggie would take the pendant back to England to his beloved wife—only to find she had died three weeks before his return from fighting. Maud’s Stone is one hundred and fifty years old. The stone holds its own power. The stone’s precious beauty will be sold, cherished, stolen, and given away before Mrs. Anderson does the unthinkable. A short story of fifty pages to take on a summer picnic, or to enjoy by a cosy fireplace in winter. Maud’s Stone. A beautiful red pendant is one day found by a British solider in an uprising in India, but he soon sells it on when he becomes alarmed by the mysterious powers it possesses. 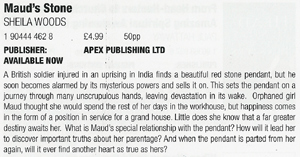 The pendant lands into many unscrupulous hands until one day it lands into an orphaned girl’s hands named Maud, Maud thought she would spend the rest of her life in the workhouse, but now she has found happiness in the form of a position in a grand house. Maud must now discover how the pendant can help her find out about her parentage, and if and when it leaves her, will it ever find a heart as true as Maud’s... Read this enchanting book to find out. Maud’s Stone wins 9 pizza slices. A very good book; which I thoroughly enjoyed. An exciting story, well presented and enjoyable! This has a brilliant story, loved to the end. A good story which held me to the end. A very enjoyable read. An original story which had me gripped from the start. Highly recommended!